Whistle while you work! The Vacumatic system of cooking allows you to relax and do other things while cooking. When you hear the tone from the 'whistle vent' you simply close the 'Vac-Controle' valve and turn off the heat. Your food will then cook automatically off the heat in a vacuum vapor. No more pot watching or boiling dry. All of your vitamins, minerals, flavor and color is preserved only by cooking in a vacuum vapor. 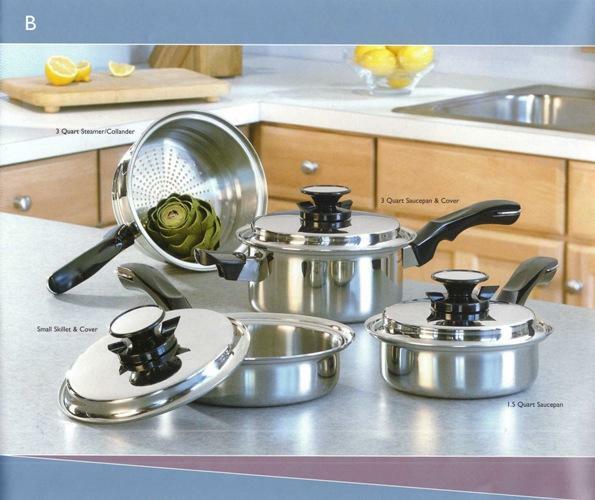 Includes; 3 quart and cover, 1.5 quart and cover, small skillet and cover and steamer/ strainer.